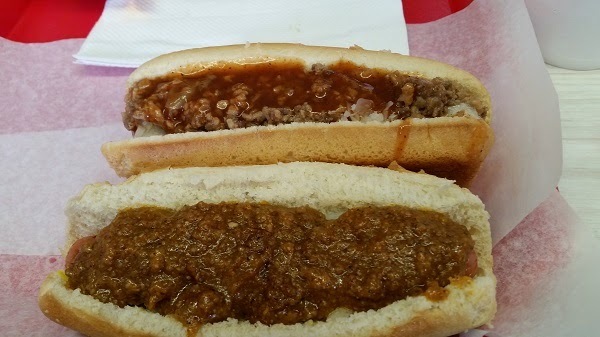 Gus’s Hot Dogs, Adamsville AL – Marie, Let's Eat! On Sunday afternoon in Memphis, our daughter bought a very nice blue dress. On Monday, she wore it and received more compliments from the crowd at Gus’s Hot Dogs in Adamsville than the local homecoming queen probably got last fall. There’s a whole bunch of really friendly people in this town, and by 11.15 each day, they’ve swarmed into Gus’s. We were lucky to find a table. Birmingham’s love of hot dogs is very well documented – there’s a fun blog about them and a Southern Foodways documentary, for example – but one thing that, with respect, has not been documented well is the distinction between the many hot dog places that are named “Gus.” Not even Bham Wiki is clear on the subject. So here’s an attempt at clarification that should thrill all three of you who are anxiously awaiting the next update about Shrimp Boat versus Shrimp Boats. In the greater Birmingham area, there are at least seven hot dog shops that call themselves some iteration of “Gus.” Four of these seven are related through a family tie, yet they are not, formally, a chain, but rather four independent restaurants: these are the locations in Mountain Brook/Crestline Village (which I believe is the original), downtown (which we visited in 2010), Hueytown, and this one in Adamsville, which we visited on our way home. These four, and only these four, are “Gus’s.” That’s s-apostrophe-s, the trademarked spelling, and “Hot Dogs,” plural. With me so far? Well, for those of us who enjoy our loyalties – Brandi’s are, after all, my favorite dogs as well – but also love exploring, this Gus’s is really good. 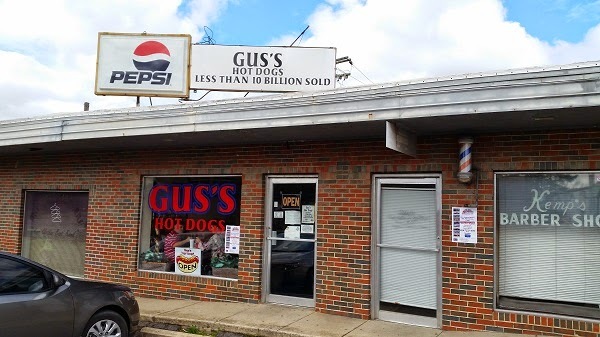 I enjoyed a Gus Dog, which comes with mustard, onions, kraut, and the wonderful dark tomatoey sauce, and one with chili, and a Pepsi. Marie had a Special, and the three year-old demonstrated his insistent command of the potato chip rack. He really loves chips, and he’s remarkably impatient. He spotted the bags of Golden Flake and, loud as an air raid siren, let us know what he wanted. We ordered a plain dog for him, and while he was happily yelling about all the chips he could select – which is particularly amusing since he can’t read yet – my daughter quietly asked whether she could have a bag. This really is funny; my daughter is actually the loudest person I have ever met. If you’ve ever heard Tom Hanks’ anecdote about “Slappy” Norman shouting about bending his golf clubs, you’ve got an idea. I’ve been asking this kid to pipe down for sixteen years, and the only time she is ever, ever at all quiet is when we’re in a restaurant and she suddenly gets really shy – it’s especially hilarious when there’s a cute boy at the register – and asks me in a worried whisper whether she can have such-and-such. So I asked my son to get a bag of chips for his sister, and if the county had needed to activate the civil emergency alarms, nobody would’ve been able to hear them over him, as he shuttled back and forth between the rack and the table that we claimed. “HEY! YOU WANT CHIPS TOO?! I LIKE CHIPS! HERE YOU GO, I GET YOU CHIPS! YOU WANT MORE CHIPS?! THESE THE RIGHT KIND? !” The older folk taking tables and greeting all their friends somehow then drown him out with laughter. Our son is evidently, to hear some of the nice women tell, almost as cute as many of their own grandchildren. One older gentleman passes our son a dollar, because he’s Santa Claus and does this for children. I kind of like this town. The hot dogs are splendid, too. Posted on April 27, 2015 August 21, 2017 by Grant G.Posted in alabama, birmingham, hot dogsTagged alabama, birmingham, hot dogs.